We start skiing on Thanksgiving weekend. Our lodge is our home base for both skiing and nightlife. Skiers and boarders have a wide range of terrain to choose from. 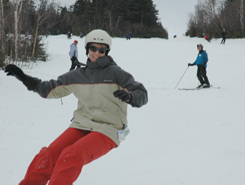 Sugarbush and Mad River Glen are both minutes away, so are a variety of cross-country facilities, and sometimes we make a short expedition to Stowe. 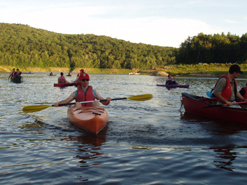 The club also has two races each year, and everybody's welcome (and encouraged) to give it a try. After skiing, you can stop in the nearby village and do a little shopping, or just head back to the lodge for aprés ski snacks, time in the sauna, a cocktail hour, and then dinner. Afterwards chairs are pushed aside to make room for dancing. Other nights may be quieter. You'll find us playing pool, foosball, scrabble, cards or other games or curled up by the fireplace talking or reading. Every weekend is special, with its own tempo and collection of people. During the weekend, everyone has a light cooking or housekeeping task, which helps bring everyone together and keeps the cost of your weekend low. We arrange carpools whenever possible, so if you don't have a car, that's not a problem. (In fact, some think it's even better!) 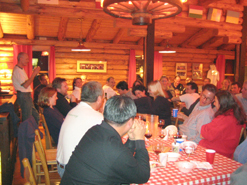 Annually, the club also sponsors a group ski trip to Switzerland or out West. See our calendar for details on this year’s trip. We're also active in spring, summer and fall. The Green Mountains in Vermont have lots of great trails for day hiking. Road and mountain biking often lead to Ben and Jerry's original ice cream factory in Waterbury.